2012 was a HUGE year for social media – especially for mobile. Twitter revamped their mobile app, Facebook followed suit and overhauled Facebook for iOS (which was sorely needed). Then, not to be outdone, Pinterest launched business pages for Pinterest, which allowed businesses to create their own accounts that didn’t require a complex way to squeeze your business into the first name and last name fields (finally). Besides mobile, 2012 was also big for investors as well, as Facebook went public – and who can forget about Facebook Timeline, which also launched in 2012 – I know, it’s hard to remember all the way back to January 2012. So what else happened with social media in 2012? Take a look at this infographic on everything that happened in social media in 2012. Just like your blog, your YouTube channel has its own RSS feed. 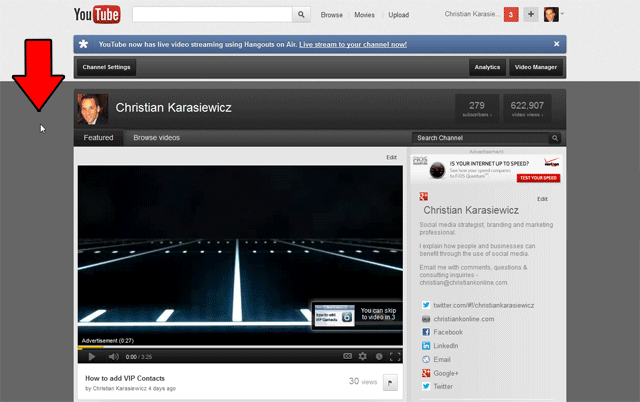 What this means is that you can now see updates as they’re happening from your favorite YouTube channels. This is good news for anyone who uses an RSS feed reader such as Pulse to consume their favorite websites and blogs from their smartphone because now, instead of going to check out your favorite YouTube channel to see if they have uploaded any new videos, you can access the YouTube channels RSS feed to see any recent updates anytime. Here’s an example of my YouTube channel RSS feed. If you’ll notice, it is very important to fill-in as much descriptive information about your YouTube videos and to include a custom YouTube video thumbnail because this information is pulled into RSS feed aggregators such as Google News and Pulse. Without a custom YouTube video thumbnail your videos won’t be as eye-catching to readers. If you don’t include a description or title for your video, RSS feed readers might not pick-up your video so you’ll want to be sure include this in your YouTube videos. Enough about what is and is not included in a YouTube channel RSS feed. How do I find a YouTube channel RSS feed? You’ve probably heard of Google+ hangouts. If not, here’s what they do. Google+ hangouts let you host video conferences with nearby friends, family across the globe, and hold important meetings with business partners and customers. While that’s pretty impressive for a free product, what I’m most excited about with Google+ hangouts is the last one – you can record them (through “On-Air”). Why is it so remarkable that you can record Google+ hangouts?